Note: Move your downloaded data to folder /Android/obb/com.joycity.potc. 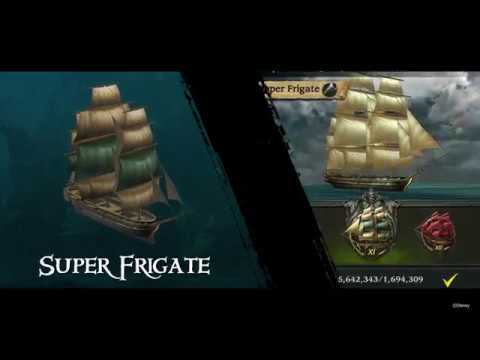 Start a new voyage and sail into this huge update!. - NEW Shade of Captain Armando Salazar, plus the fearsome Silent Mary sails into the Caribbean. - Together with Alliance Members, win the battle! Fight for honor! Alliance Battle updated.. - Hire at the Pub Sp. Lvl 3! Tier 12 Pirate Sharpshooter updated! . - Gunpowder Expert, New Tier 3 Tactician Malik Bolston is out!. - Beware, Captain! Sea monsters off the port bow! New monsters unleashed! You are the captain of your pirate haven in Pirates of the Caribbean: Tides of War. Recruit notorious marauders to your mighty corsairs to dominate the ocean! !THE OCEAN IS YOURS TO RULEBecome a legendary pirate captain and plan out assaults against millions of other pirates from all around the world... see more You are the captain of your pirate haven in Pirates of the Caribbean: Tides of War. Recruit notorious marauders to your mighty corsairs to dominate the ocean!! (When game updating) We need your permission to save the update files onto your device&apos;s SD card. [Pictures, Media, File Access] includes the authority to access SD card. If you refuse the request, you will be unable to login.